Westinghouse Electric Company and its "parent guarantor" Toshiba Corp are committed to completing the two new Westinghouse AP1000 nuclear power units under construction in Jenkinsville, South Carolina. 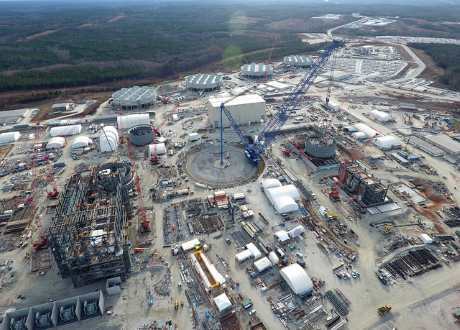 SCANA Corp said yesterday its main subsidiary, South Carolina Electric & Gas Company (SCE&G), and VC Summer Nuclear Station co-owner, Santee Cooper, had received this "reaffirmation". Toshiba announced yesterday it would reduce its exposure to reactor construction projects outside Japan. Westinghouse is building four AP1000 units in the USA - two each at Vogtle and Summer. It is also building four AP1000 reactors in China, two each at Sanmen in Zhejiang province and Haiyang in Shandong. SCANA said Westinghouse has also provided SCE&G with revised in-service dates of April 2020 and December 2020 for Summer units 2 and 3, respectively. "The completion dates provided in the new schedule are within the 18-month contingency period provided under the construction provisions of the Base Load Review Act administered by the Public Service Commission of South Carolina and would enable both units to qualify, under current law, for the federal production tax credits," SCANA said. SCE&G will monitor Westinghouse's "ability to adhere to the new schedule", as well as Westinghouse and Toshiba's financial condition and its "effect on their ability to complete the project". Cayce, South Carolina-based SCANA plans to hold an earnings call on 16 February, as previously announced. NuGeneration, Toshiba's UK joint venture with France's Engie, said yesterday that Toshiba was committed to its project to build a nuclear power plant of up to 3.8 GWe gross capacity at Moorside in northwest England, using AP1000 nuclear reactor technology. Toshiba, which bought Westinghouse in 2006, warned in December last year that it might have to write off "several billion" dollars because of the purchase in 2015 of US construction firm CB&I Stone & Webster. The Japanese electronics conglomerate said yesterday it expected to report a net loss of JPY390 billion ($3.4 billion) in the year to March 2017 and said it would book a JPY712.5 billion ($6.3 billion) loss on its US nuclear unit. Toshiba said the figures were provisional and under review by an independent auditor.